We repair, service, maintain and install all makes and models of air conditioning equipment. However, we prefer the TRANE brand above all others. We have found TRANE’S equipment to be reliable, long lasting, engineered well, and backed by an excellent company. 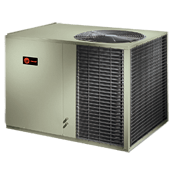 These products are just the models of systems we currently offer; If you are interested in upgrading your homes comfort system, please schedule your free in-home consultation so that we may quote you on a system tailor fit for your home. 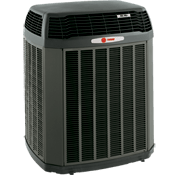 Straight Cool air conditioning units only provide cool air out of the box, but can be upgraded to provide heat using electric heat strips or a gas furnace. Heat pumps run on all electric 240 volts and provide heating and cooling by reversing the flow of refrigerant. Price: As low as $8900 or $148/mo. The XV20i is TRANES newest high efficiency equipment line. 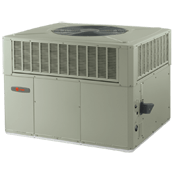 The XV20i uses revolutionary technology to achieve the highest efficiency, the most exact comfort levels indoors, and amongst the quietest operation.This unit must be installed with TRANES newest communicating air handler and 7″ touch-screen digital thermostat. Price: As low as $8200 or $136/mo. The XL20i is TRANES other option in high efficiency home comfort equipment. The XL20i uses traditional HVAC technology engineered to achieve the highest efficiency ratings, very precise indoor comfort levels, and is amongst the quietest in operation. This unit also has the technology to allow it to communicate with TRANES high efficient indoor air handler, and should be installed with a communicating air handler and thermostat. Price: As low as $8100 or $135/mo. The XV18 is TRANES high efficient system with the smaller metal form factor. The XV18 is a very quiet variable speed air conditioner with-out all the bells and whistles. It excels in keeping your home cool and removing humidity while also keeping energy usage down. This condensing unit should be combined with TRANES high efficient air handlers to achieve maximum efficiency and home comfort. Price: As low as $7300 or $121/mo. The XL18i is a two-stage compressor system built using TRANES newest form factor design. It is a ultra durable, highly efficient air conditioner that is time tested and proven. This condensing unit should be combined with TRANES high efficient air handlers to achieve maximum efficiency and home comfort. The XL16i is a small step down from the XL18i series in efficiency. It has many of the same features as the more efficient options, and is also a very reliable home comfort system. 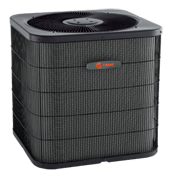 This condensing unit should be combined with TRANES high efficient air handlers to achieve maximum efficiency and home comfort. Price: As low as $6100 or $101/mo. The XL15i is smiliar to the XL16i and can achieve the same efficiency levels if paired with a high efficency air handler. The XL15i is a single stage air conditioner, and in fact is TRANES quietest single stage air conditioning system. The XL15i takes on the same well designed form factor of the higher efficiency multi-stage XLi model air conditioners. Price: As low as $5000 or $83/mo. The XR series air conditioners are built in the shorter, metal cased design. They use a two-stage compressor (depending on exact model) but are less technologically advanced, but if paired correctly can achieve super efficiency levels at a budget price. Price: As low as $5100 or $85/mo. The XB series is similar to the XR series in design. They utilize a metal frame and a shorter profile. They run slightly louder and less efficient than the XR series, and carry a slightly shorter warranty period. They are a budget friendly option for home comfort. 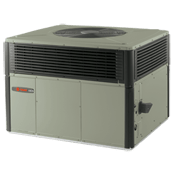 Most of TRANES packaged units are available as both heat-pumps and gas furnace with electric cooling. All of TRANES packaged units will last a very long time, and are almost impervious to the harsh outdoor conditions here in Arizona. They are an excellent choice if you are concerned with quality and durability. They are all about as quiet or quieter than a vacuum cleaner. It’s almost hard to tell when its even running. Price: As low as $6900 or $115/mo. The XL16c is a high efficiency packaged unit that is available in both gas and electric models. This unit utilizes a two-stage compressor and variable speed blower motor technology. This means precise temperature and humidity controlled indoor air, and lower energy bills. The XL16c is a powder coated metal cased unit with excellent protection from the elements. This unit will stand up to the worst hail storms Arizona will see. Price: As low as $5200 or $86/mo. The XL14c is a small step down from the XL16c systems in efficiency and sound rating. They are equipped with a single stage compressor and a variable speed indoor blower motor. They will still provide exact comfort indoor air and lower utility bills. They are built in TRANES metal cabinet with excellent outdoor coil protection. 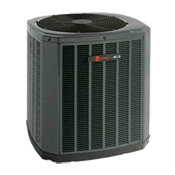 It’s hard to stop a TRANE, and these units are an excellent investment. Price: As low as $4700 or $78/mo. The XL13c is a small step down from the XL14c systems in efficiency and sound rating. They are equipped with a single stage compressor and a standard speed indoor blower motor. They will still provide steady indoor temperatures and reasonable utility bills. They are built in TRANES metal cabinet with excellent outdoor coil protection. Price: As low as $4600 or $76/mo. The XB13c is TRANES least expensive packaged unit offering. It still is equipped with the sturdy climatuff single stage compressor, and a standard speed blower motor. It also is built inside of a metal chassis, which means durability and longevity.